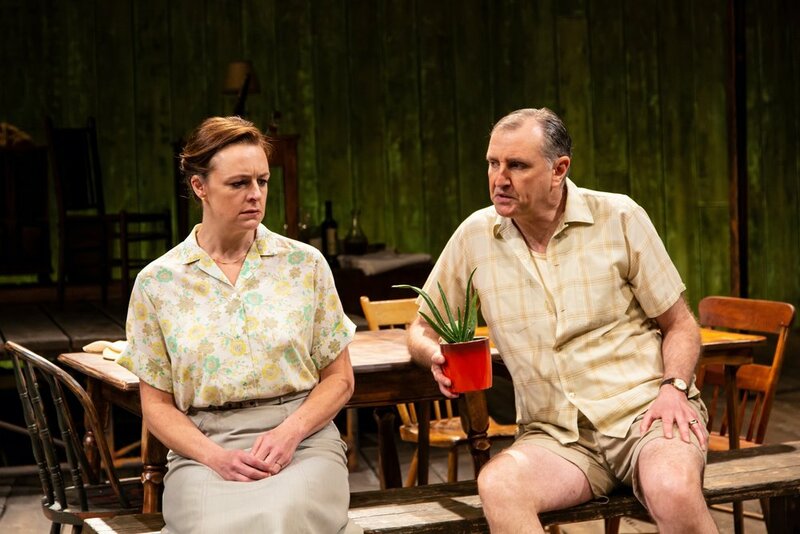 Athol Fugard’s A Lesson from Aloes is a taut, fraught drama about weathering the storms of marriage and friendship as well as the storms of terrible social and political conditions. In other words, it might have a lot to say to us now, much as it did in the early 1980s when Fugard finally finished and produced a play he’d begun in the early 1960s. The original context for the play was a bus boycott by anti-apartheid workers and the massacres of protesters by police in South Africa, where the play is set. When the play was first produced, the fate of Stephen Biko created an immediate relevance, and it’s interesting to see how a play intended to intervene in its contemporaneous situation plays out half a world away and almost forty years later. Directed by Darko Tresjnak with a firm grasp of how to pace this play and make the most of its tensions, A Lesson from Aloes presents Piet (Randall Newsome) and Gladys (Andrus Nichols), a white couple attempting to talk normally while waiting for invited dinner guests. He’s of Dutch descent, she’s of British colonial stock. Steven, an old comrade of Piet’s from the protest movement, is supposed to call on them with his wife and three children. The discomfort between Piet and Gladys seems to be caused by the need to entertain, but gradually, as we learn more about the situation, we see that Gladys is trying to cope with the aftermath of a police raid in the couple’s home, and that Steve, who is identified under apartheid as “colored,” has recently been released from prison for alleged political crimes, and that Piet is under some suspicion for what part he may have played in the arrest. Piet, in a wonderfully modulated performance by Randall Newsome, is a thoughtful man who likes to quote great British writers in his Afrikaners’ accent, and who has become obsessed with cultivating and cataloguing his collection of aloe plants. The plants, in their spiny oddity, line the rim of the stage, an outdoor deck on the couple’s home, and stand as metaphors for having the knack of flourishing and flowering in the harsh veld. How does one survive in a devastated environment? By a kind of steady osmosis of what nourishment can be found, Piet seems to think. The plants oppress and disturb Gladys, a sign of her vulnerability even before we know her story. There’s a brooding power to the play’s first act, where every statement becomes a difficult negotiation with the past, as both political and personal affront. Gladys can’t get over the violation of having police agents reading her private diaries and has her doubts about Piet, whose efforts to make nice might be a glib avoidance of guilt. In the second act, when Steve (Ariyon Bakare) finally arrives, the play shifts into a more overtly emotional tone, if only because the social aspects of the visit—Steve and Piet are still affectionate chums—might all be theater to avoid recrimination and defense. Both Steve and Gladys are given outbursts that go a long way to making their individual trials clear and convincing. As Gladys, Andrus Nichols is a great asset, able to move from withdrawn to confiding to a kind of stringent loathing that encompasses the country she can no longer tolerate, much as she can’t tolerate her husband and herself for remaining. Ariyon Bakare’s Steve arrives jesting, and then warmly takes the couple into his confidences about the problems of packing up and moving—he has decided to go into exile in England rather than live under a ban that refuses him a livelihood in his homeland. With the wine flowing, it’s only a matter of time before the questions lurking under the friendliness begin to surface. The choice of this play now is a deft move by Hartford Stage’s artistic director—for one more season—Darko Tresjnak. When Piet, early in the play, voices his unshaken faith that man-made laws can be changed and life can improve, we hear the hope that drives political commitment, a lesson an aloe can’t teach. And when, later in the play, Gladys speaks to her husband of her distress, with barely suppressed rage and despair, Piet sits in his chair, lit a bit like an icon, a figure for “white maleness” in its insular convictions, a kind of weed able to flourish even where it’s not indigenous. We’ve heard from his wife and from his colored comrade, and we see in Piet perhaps Fugard’s own struggle to get his audience beyond that bland acceptance of how things are—because they could always be worse—that we might as well call “privilege.” Or is it simply a mask to mimic the imperturbability of the aloe? Jane Shaw’s sound design plays subtly with natural sounds and subdued percussion, while Matthew Richard’s flawless lighting design incorporates candlelight and atmospheric silhouetting. 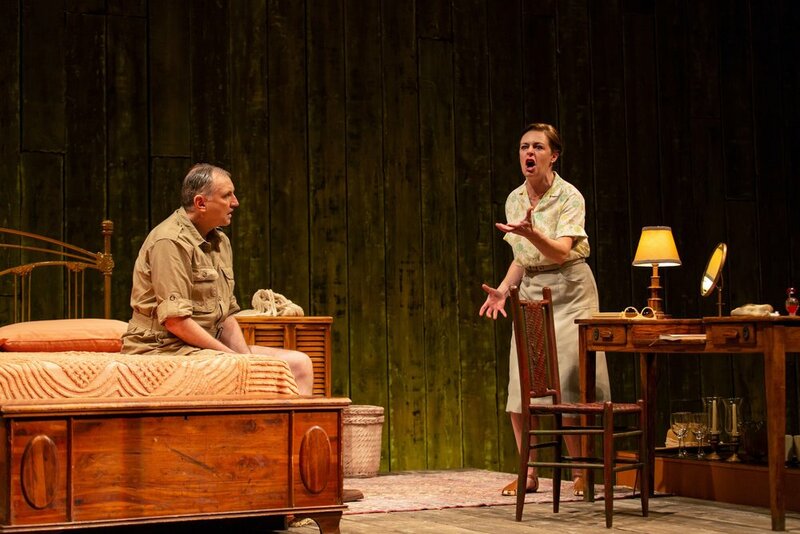 The set by Tim Mackabee has a rough-hewn beauty that looks, like it should, as an attempt to maintain familiar comforts in a wilderness where the harsh environment is matched by harsh policies. 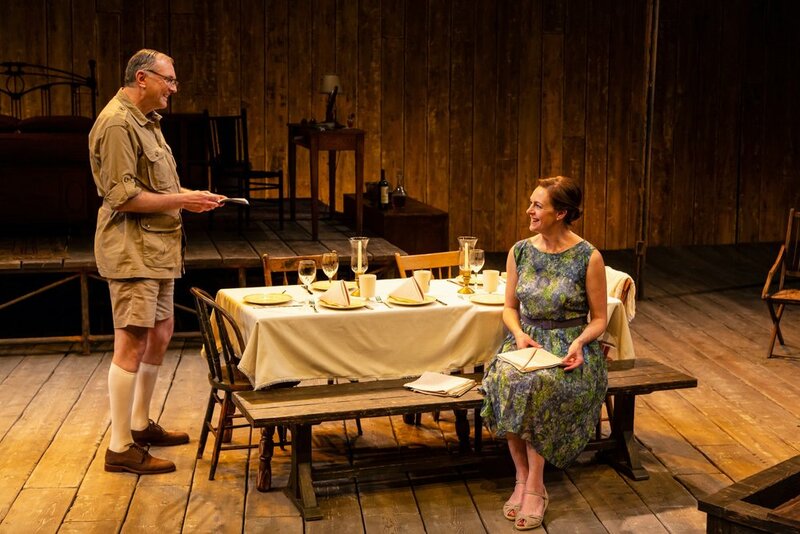 Sharply written, well-acted, handsomely mounted, and tellingly presented by its director, A Lesson from Aloes is one of the best productions of the season of Connecticut theater it closes.